We have taken our long-awaited south tour this year. Here are some of the highlights of the tour. 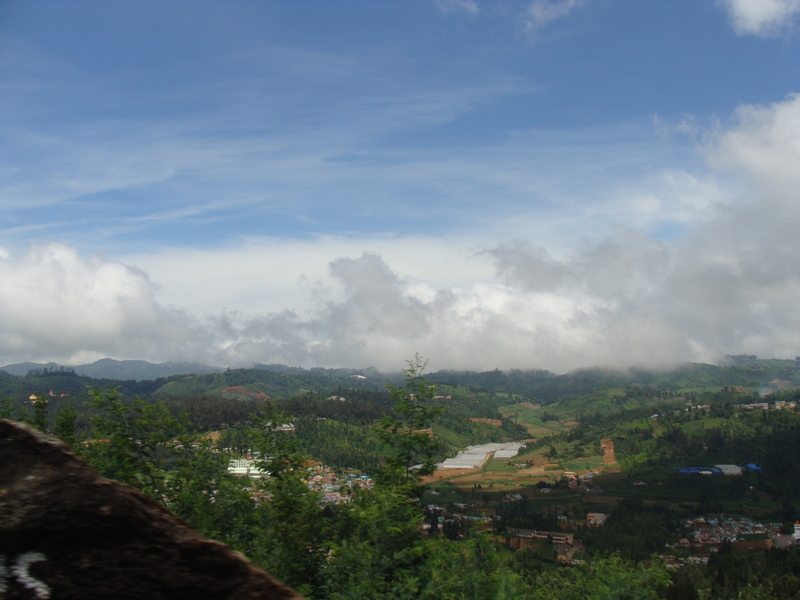 Udhagamandalam (sometimes Ootacamundsometimes abbreviated Udhagai and better known as Ooty, is a popular hill station located in the Nilgiri Hills. Originally occupied by the Todas, the area came under the rule of the East India Company at the end of the 18th century. Today, the town’s economy is based on tourism and agriculture, along with the manufacture of medicines and photographic film. Tea, spices and hand-made chocolates are famous. 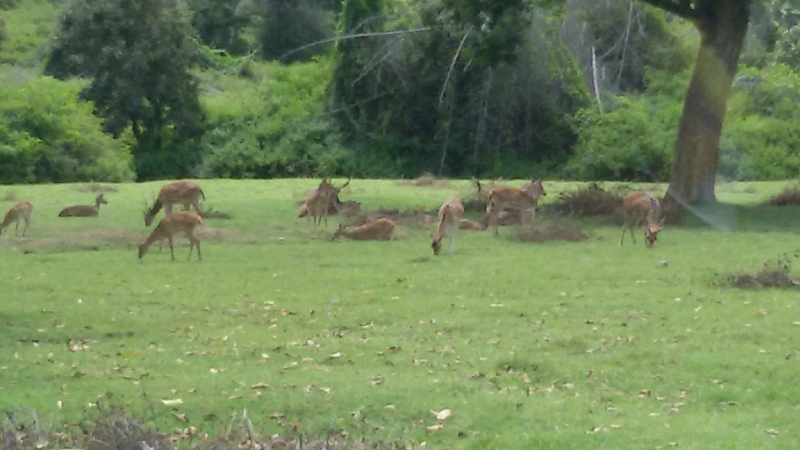 On our way to Ooty,we crossed Bandipur National park and encountered many animals on road side. 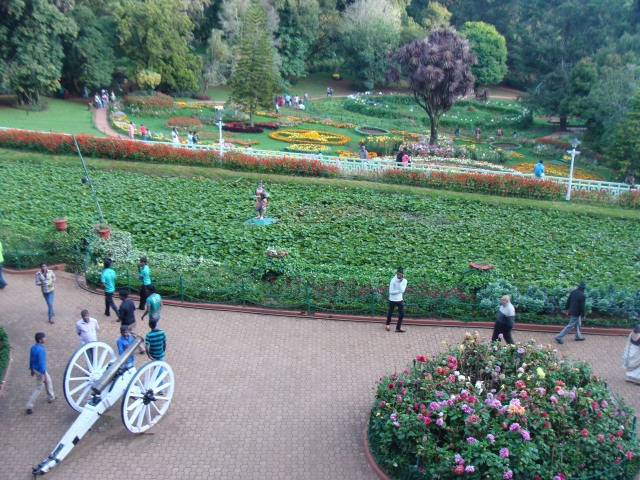 The Government Botanical Garden is a botanical garden in Udhagamandalam (Ooty), Tamil Nadu state, India laid out in 1848. The Gardens, divided into several sections, cover an area of around 22 hectares, and lie on the lower slopes of Doddabetta peak. The garden has a terraced layout. It ascends the slopes of the hill at an elevation of 2250–2500 metres above Mean Sea Level. The garden enjoys a temperate climate.It has many rare trees, a very old fossilised tree being one of them. The shops are quite good. There are hordes of good spices, fruits and homemade chocolates to choose from. But we had a bitter experience. One of the shopkeepers cheated us. Even after taking the payment they refused to hand over the chocolates insisting that they had already given. Later we came to know that this scuffle is the regular occurrence and Ooty Police have given instructions to install CCTV cameras in all the shops, big or small. The Nilgiri Mountain Railway is a railway in Tamil Nadu built by the British in 1908 and was initially operated by the Madras Railway. The railway still employs its fleet of steam locomotives. . In July 2005, UNESCO added the Nilgiri Mountain Railway as an extension to the World Heritage Site of Darjeeling Himalayan Railway, the site then became known as “Mountain Railways of India. After it satisfied the necessary criteria, thus forcingthe abandonment of the modernisation plans. For the past several years, diesel locomotives have taken over from steam on the section between Coonoor and Udhagamandalam. Local people and tourists have led a demand for steam locos to once again haul this section. 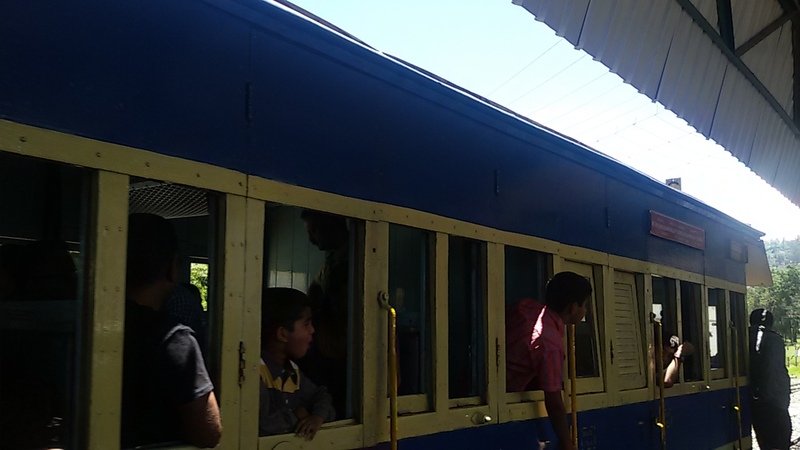 It is also a heritage railway like Toy Train of Simla (you can read about it here). The experience of the ride was wonderful but getting a ticket is a difficult one. You have to stand the line for hours. But there is an interesting catch. 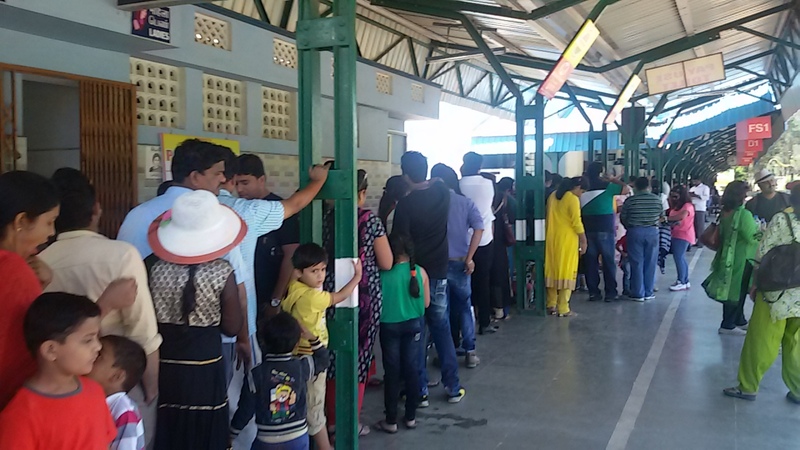 You can also get the tickets from Shiv Sagar Inn situated across the road. There are two times of tickets, first class tickets and second class tickets. There is not much difference in seating arrangement but to board the train with a second class ticket there was a very long line. Tickets can also be booked from IRCTC but that should be done around 2 months in advance. Here is a nice video about. Ooty lake is an artificial lake constructed by John Sullivan, in 1824. The water flowing down mountain streams in the Ooty valley was dammed to form the lake. The lake became empty on three occasions when it breached its bund. The lake was originally intended to be used for fishing with ferries being used to travel across the lake. It gradually shrunk from its original size giving place to the current bus stand race course, and the lake park. The Tamil Nadu Tourism Development Corporation on behalf of the Tourism Department took the possession of the lake in 1973, for providing boating facilities as a tourist attraction. The lake is surrounded by groves of Eucalyptus trees with a railway line running along one shore. During the summer season in May, boat races and boat pageantry are organised for two days. The boat house, which adjoins the lake was opened by the Tamil Nadu Tourism Development Corporation (TTDC). Boating is the prime attraction at the lake. The boat house offers boating facilities with Paddle boats, Row boats, and Motor boats. It also features a garden, a mini train and an amusement park.The other notable features include a canteen run by the TTDC and pony rides in front of the boat house. Sadly, according to a study conducted by Tamil Nadu Pollution Control Board, Ooty lake is the most polluted water body in the state and its water is not fit for potable purposes. Coonoor is a Taluk and a municipality in the Nilgiris district in the state of Tamil Nadu, India. 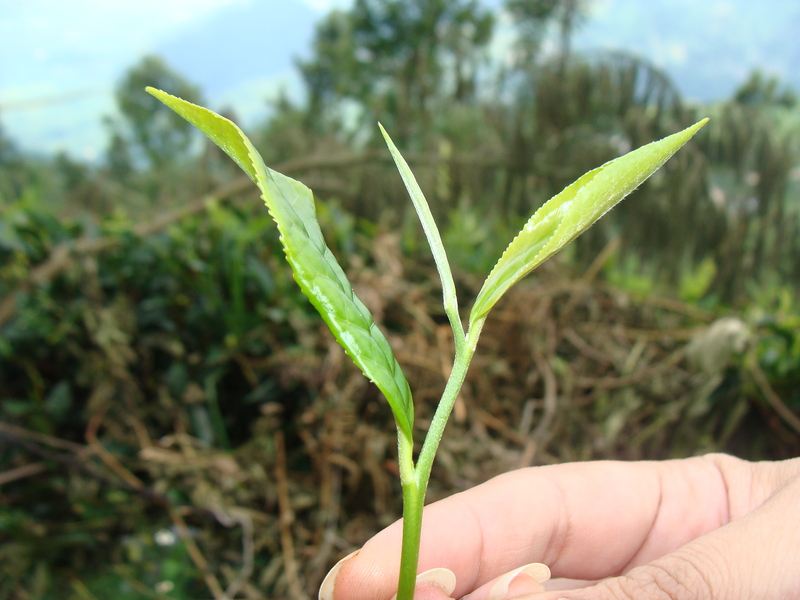 It is known for its production of Nilgiri tea. Coonoor is located at an altitude of 1,850 m above sea level and is the second largest hill station in the Nilgiri hills after Ooty. It is an ideal base for a number of trekking expeditions leading into the Nilgiris. 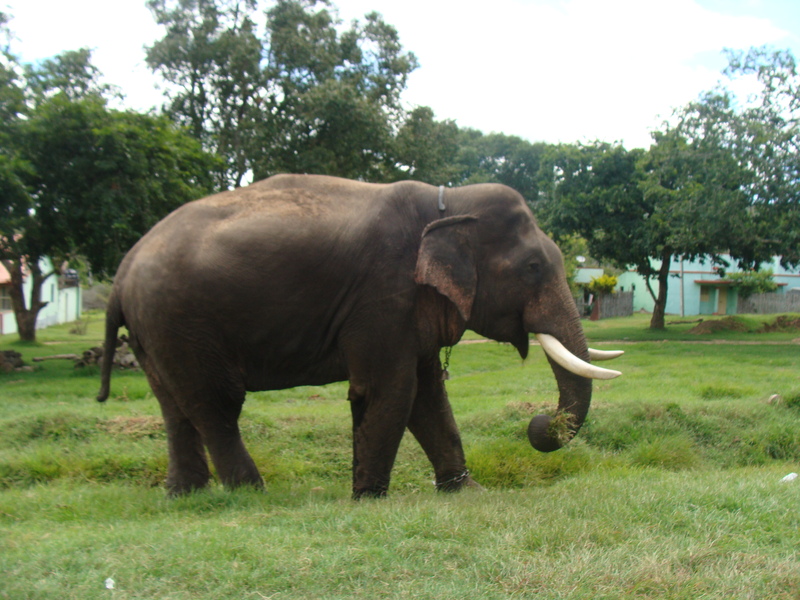 The Nearest airport is Coimbatore International Airport about 79 km from Coonoor town. the best way to reach Coonoor from Ooty is Nilgiri Railways. We reached here by train and took a taxi tour of tea estates and other destinations. Taxi rides are available at affordable rates. The Charminar is a monument and mosque located in Hyderabad, Telangana, India. 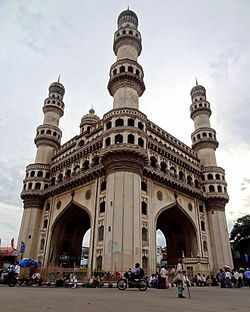 The landmark has become a global icon of Hyderabad, listed among the most recognized structures of India. The Charminar is situated on the east bank ofMusi river.To the west lies the Laad Bazaar, and to the southwest lies the richly ornamented granite Makkah Masjid. Famous Pearl Jewellery of hyyderabad is available in market near Hyderabad. Tasty and juicy Munjal fruits are also sold around Charminar. 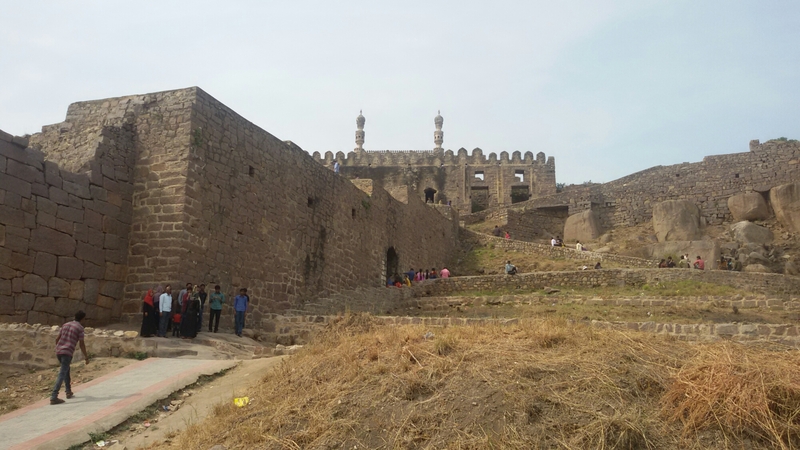 Golconda, also known as Golkonda or Golla konda (“shepherd’s hill”), a fort of Southern India and capital of medieval Golconda Sultanate (c.1518–1687), is situated 11 km west of Hyderabad, Telangana. The region is known for the mines that have produced some of the world’s most famous gems, including the Koh-i-Noor, Hope Diamond and theNassak Diamond. The fort is very green and looks formidable. We have also seen some innovative use of solar energy in the fort. The Salar Jung Museum is an art museum located at Darushifa, on the southern bank of the Musi river in the city of Hyderabad in India. It is one of the three National Museums of India. It has a collection of sculptures, paintings, carvings, textiles, manuscripts, ceramics, metallic artefacts, carpets, clocks, and furniture from Japan, China, Burma, Nepal, India, Persia, Egypt, Europe, and North America. 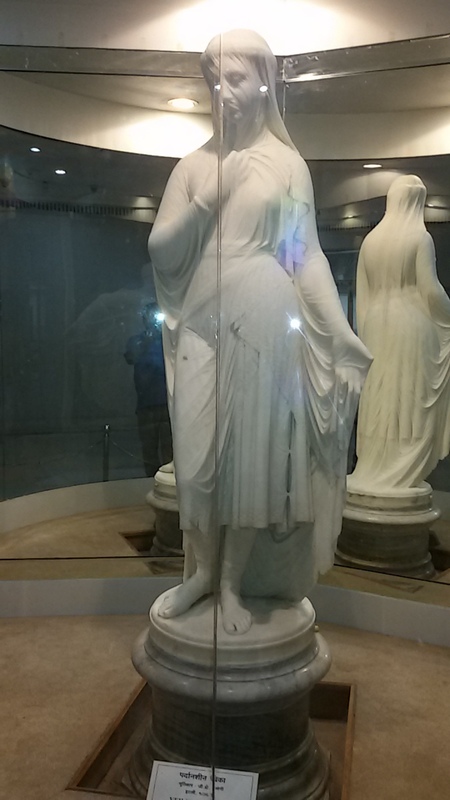 The museum’s collection was sourced from the property of the Salar Jung family. 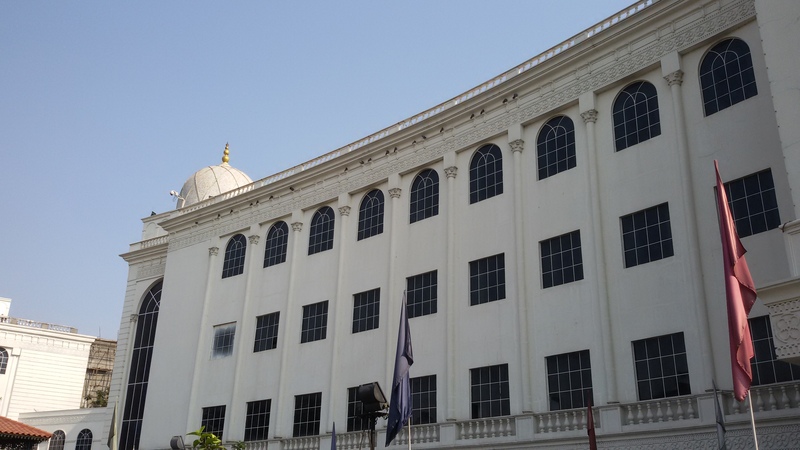 Maulana Azad National Urdu University is a Central University located in the city of Hyderabad in India. It was named after Maulana Abul Kalam Azad, India’s first Minister of Education, a freedom fighter in India’s struggle for independence, and a scholar of Islam and Urdu literature. The university was established by an Act of the Parliament in January 1998, with an All India jurisdiction. The University has been awarded “A” Grade by National Assessment & Accreditation Council (NAAC). It is a unique university in the regard that the university is established to promote a particular language. One of the prominent tourist spots of Hyderabad, Necklace Road presents a fun-filled and calm environment to spend some relaxed moments. Built in the same way as the Queen’s Necklace of Mumbai, the Necklace Road of Hyderabad also resembles a necklace. Stretched across a length of three-kilometer, the Necklace Road connects three major parks of the city, namely NTR Gardens, Lumbini Park and Sanjeevaiah Park. The road runs from NTR Gardens and Lumbini Park in Hyderabad to Sanjeevaiah Park in Secunderabad. And from Sanjeevaiah Park it runs to the Tank Bund Road which is later connected to the NTR Gardens. This gives it a shape of a necklace. Between 1983 and 1989, N. T. Rama Rao served as the Chief Minister of Andhra Pradesh. During his tenure. During his visit to New York, he saw the Statue of Liberty and was inspired by the efforts to restore it. He said, “I wanted something like that … That would have been my contribution to society. He commenced the Statue of Buddha at Hussain Sagar. We have taken the ride of Necklace Road on a drizzling day. It was a wonderful experience. The Ramoji Film City) in India is located in Anajpur village, Hayathnagar Mandal in Hyderabad, Telangana. 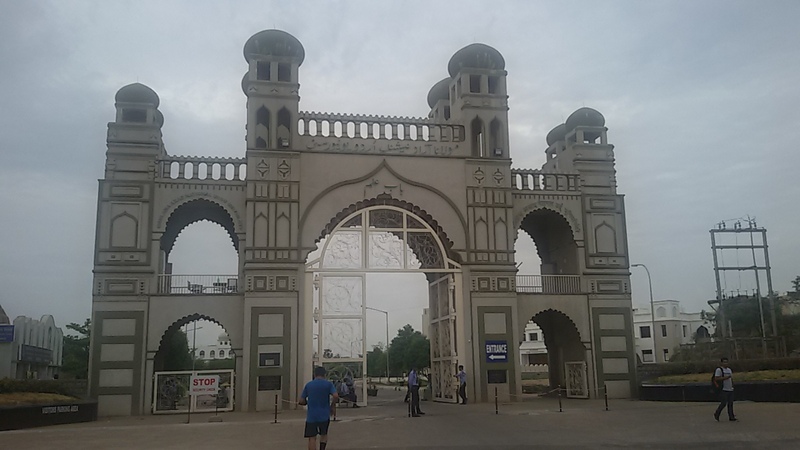 At 1666 acres, It is the largest integrated film city in the world.It is also a popular tourism and recreation centre, containing both natural and artificial attractions including an amusement park. The Outer Ring Road Phase 2 has acquired lands at the entrance and is set to intersect the city. 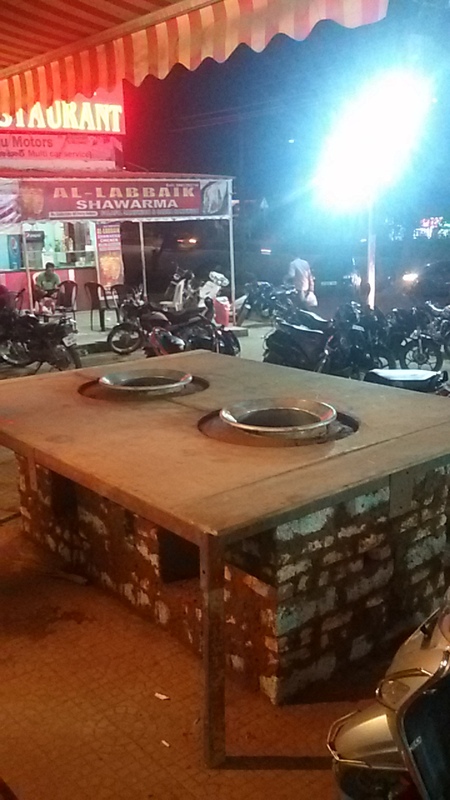 Hyderabadi Biryani is world famous and haleem is just terrific. 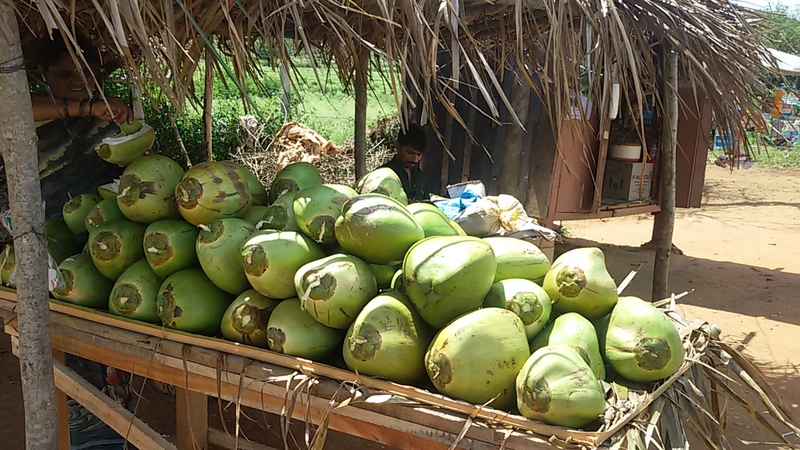 Ramadan were approaching so preparations for Haleem making were in full swing.And not to forget to mention coconut water, drank innumerable coconuts. Due to rain and traffic we were rushed to catch our flight. Reached Hyderabad Airport only 30 minutes before the take-off. Indigo people were helpful and thanks are due to them. 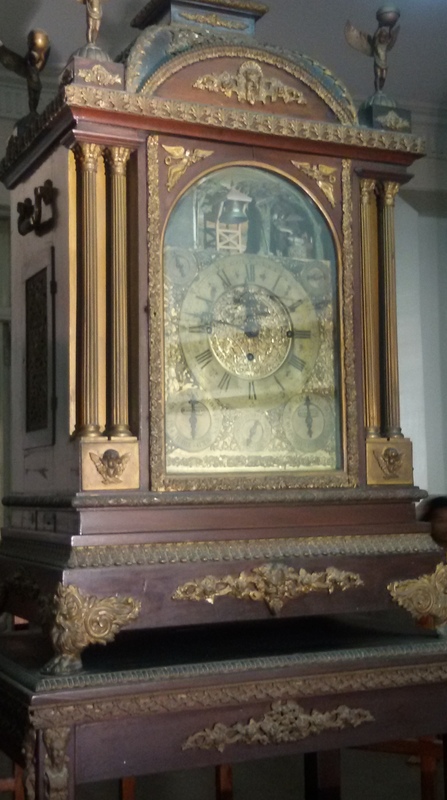 This entry was posted in Cities, Countries, Glimpses of Our Cities, India, Travel. Bookmark the permalink. Thanks. I read your blog regularly.